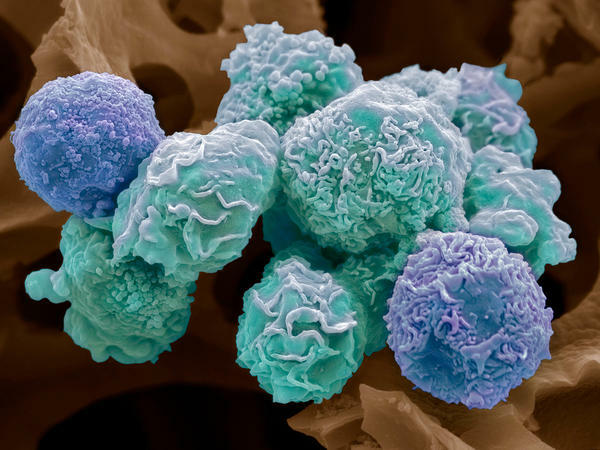 Colored scanning electron micrograph (SEM) of cultured cancer cells from a human cervix, showing numerous blebs (lumps) and microvilli (hair-like structures) characteristic of cancer cells. Cancer of the cervix (the neck of the uterus) is one of the most common cancers affecting women. Magnification: x3000 when printed 10 centimetres wide. Pap tests look for cervical cancer cells. Many medical organizations suggest women undergo both Pap tests and HPV tests. Latina and black women already have the highest rates of cervical cancer in the U.S., and more than half of women with the disease were not screened in the five years before their diagnosis, according to the Centers for Disease Control and Prevention. In September, the influential U.S. Preventive Services Task Force issued draft recommendations for women ages 30 to 64, saying they could either get a Pap smear every three years or a human papillomavirus test every five years. (The task force did not recommend changes for any other ages.) That is a change from the 2012 guidelines, which recommended undergoing both the HPV and Pap tests every five years. And that's what two dozen other medical organizations still recommend. They include the American Cancer Society, the American College of Physicians and the American Congress of Obstetricians and Gynecologists. In response to the task force's draft recommendations, ACOG and the American Society for Colposcopy and Cervical Pathology issued a joint statement reaffirming their support for testing for both every five years, or screening with a Pap alone every three years. In 2014, 12,578 U.S. women were diagnosed with cervical cancer and 4,115 died, according to the CDC. But those numbers obscure demographic disparities. "We are concerned about the women who basically will fall through the cracks if co-testing does not continue to be recommended and therefore reimbursed" by insurance companies, says Carolyn R. Aldigé, the president and founder of the Prevent Cancer Foundation, who wrote an op-ed supporting continued use of testing for both. "We're particularly concerned about medically underserved women who have less access to screening in general and higher rates of cervical cancer." The task force has extended the deadline for comments on the proposed change until Friday at 8 p.m. ET. They can be filed online. 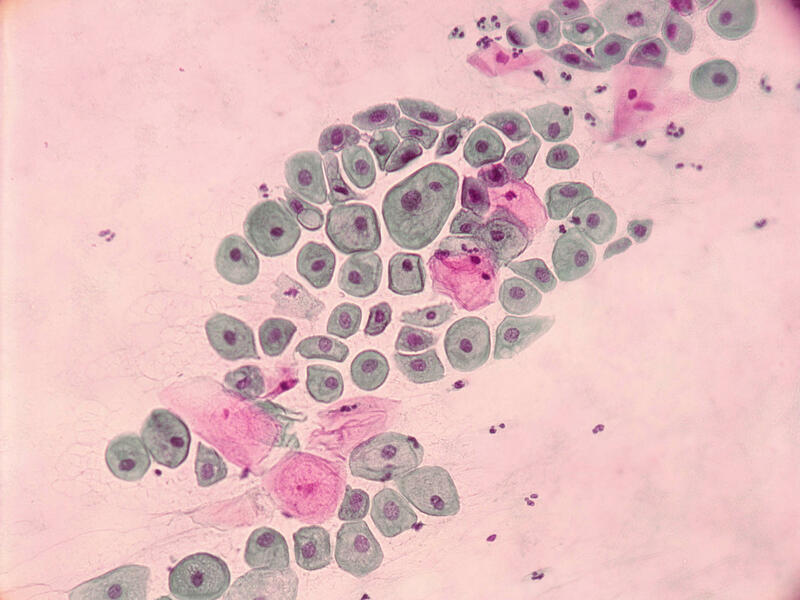 According to CDC data, Latina women have the highest rate of cervical cancer in the country. Black women have the second highest cancer rate but are more likely than Latina women to die of the disease. Limiting access to screening, especially for these groups, is "the wrong direction to go in," Aldigé says. In a statement to the task force from the National Latina Institute for Reproductive Health, Ann Marie Benitez, the organization's senior director of governmental affairs and a cervical cancer survivor, pointed out the systemic barriers Latina women face in getting adequate preventive care and the research that supports testing for both. "The largest retrospective study of cervical cancer screening strategies found that 1 out of 5 cases of cervical cancer was missed with primary HPV screening alone," Benitez's statement reads. "The USPSTF recommendations for screening must be revised to address the reality that many women at higher risk would be missed with less frequent and less comprehensive screening. Changes in this policy would put the lives of women of color further at risk." The task force relied on seven randomized controlled trials and five observational studies for their decision. Six of the randomized controlled trials were European — from England, Finland, the Netherlands, Sweden and two from the same group in Italy — and one was Canadian. Most of these countries have predominantly white populations, and only the Canadian study reported participants' race or ethnicity. The task force also noted their evidence review had no trials that directly compared HPV testing alone with testing for both. Yet the draft recommendations include HPV testing alone as a screening option, something no other medical organizations currently recommend. The trials' testing methods also differ from tests used in the U.S. standard of care, according to Dr. Harvey Kaufman, medical director at Quest Diagnostics, a large medical testing company. Neither of the two HPV tests used in the studies is the one approved for primary HPV testing in the U.S., he says, and five of the seven studies used different types of Pap tests. "Virtually every woman in the U.S. gets liquid-based cytology, which is much more sensitive and has different performance characteristics," Kaufman says. Liquid-based cytology and conventional Pap cytology are both ways to analyze cervical cells; evidence is mixed on how they differ. "So they end up with a core base of literature that doesn't apply to the U.S.," he says. Kaufman also described inconsistencies in the way the task force selectively used data. "In creating their model, they had to make assumptions about the sensitivity and specificity of cytology, HPV and co-testing," Kaufman says. Sensitivity and specificity are two ways to measure a screening test's accuracy. The task force used different studies for these numbers and then made calculations to adjust them for comparison. "The mathematical gymnastics core to their model is not supported by statistical approaches in any textbooks I've seen," Kaufman says. Even with their calculations, he says, an estimated 5 percent of women with cervical disease would be missed by HPV testing but identified with testing for both — and those are the women getting tested regularly. "In real life, particularly in the U.S. where we have a more fragmented health system, you have to build a model that acknowledges the realities of how frequently people really do show up," Kaufman says. The task force listed the main harms of screening as false positives that could lead to excess follow-up tests and colposcopies. They acknowledge that "false-positive rates are higher among women younger than age 30 years compared with older women because of the higher incidence of transient HPV infection in younger women." The populations in studies they used included women ages 21 to 65, but the recommendations for women ages 21 to 29 remain unchanged — Pap test alone every three years. For the task force, says Aldigé, "the risk of overtreatment seems to outweigh the risk of missing cancers, whereas we feel that missing a significant number of cancers outweighs the risk of overtreatment." She also worries about the effect of yet another change in recommendations, which have already undergone frequent changes in recent years. "It throws women into a state of confusion," Aldigé says. "The recommendations are constantly changing and women don't know what to do, and sometimes when people don't know what to do, they do nothing." Maureen Phipps, chair of obstetrics and gynecology at the Warren Alpert Medical School of Brown University in Providence, R.I., and a member of the task force, says the task force will take whatever time is necessary to read all public comments before deciding whether to adopt or revise their proposed recommendations. Aldigé and Kaufman hope the task force will revert to keeping testing for both for women ages 30 to 64. "One of the most notable success stories in all of health care is the fact that we have reduced the number of deaths from cervical cancer so dramatically," Aldigé says. "We need to appreciate what screening has been able to accomplish in terms of public health. We can continue to bring those numbers down with co-testing."